Low-mass diaphragm is custom-engineered for extended frequency response and superior transient response. High SPL handling and wide dynamic range. That's what you get with this mic. No frills, all business. It gives you super flat signals that are crazy easy to work with. I've used it on vocals, guitar, OH for drums as well as room mic for drums. Super accurate reproduction. The mic clip slipped a little bit and I had to really tighten it to stay in place...bought a $20.00 apex shock mount stand, fixed the problem. Insanely good mic for the money...GET ONE ! I have used the AT2020 for the past year and a bit and it has served me well the whole way! I have used it for a lot of voice over/voice acting stuff and some miscellaneous recordings of things. Totally worth the money if you are looking for your first mic! amazing product, I record vocals with it and it sounds fantastic. This mic is worth more than the value it's being sold at. It probably performs as good as most $300 mics out there in the market. 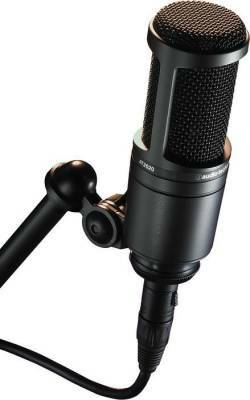 If you're not willing to pay over $300-400, definitely get this mic. Recorded demos and used just this mic alone for recording the drum tracks. Strategically placed and drums tuned it works amazingly well. I started recording vocals on this mic. I borrowed it from my brother and I almost ended up buying it off him it was that good. I wouldn't use this mic for recording audio books or super pro vocals. It sounds great for metal based vocals, female singing and whispers. 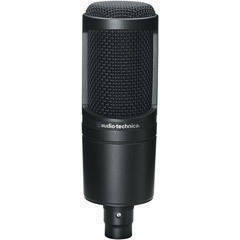 It's by no means a pro mic but for it's price you cannot go wrong. When ever people get into recording vocals and need a decent cheap mic I tell them AT2020. This is an excellent microphone. I use it on vocals, mandolin, and guitar. Very good sound quality for the price. It does have a bit higher noise floor than more expensive mics, but for $110 this is a superb sounding mic. Noise floor is a non issue when in a mix. For the price? No brainier. I love this Microphone! Nice clear sound when plugged into my audio interface! I've used it to record drum samples and vocals for a few of my songs plus it's great for talk shows and really gives off that professional studio feel. Very satisfied! Just got this mic, works great as an overhead for drums. If you're only in the budget for one mic I'd say go for this one. Gets a great sound out of the whole kit. This is a great mic for the price. It wounds relevantly neutral when recoding acoustic instruments, however this microphone has a pretty high self-noise. Other than using this mic to record home demos, I use it live on banjo, mandolin and fiddle and it's never let me down. The construction also feels very solid and well engineered. These are the first condensers i have ever owned but i love them! I bought 2 of these to use as overhead stereo mics on my drums and they sound awesome! I also use them on my guitar amp (one on axis of the center of the cone and one off axis on the edge of the cone) and i get a great sound! I have been recording for a few years now (amature) but i am highly impressed with them! I highly suggest them to everyone!!! I borrowed this mic from a friend of mine, never really used it till recently to record a female just speaking. The quality was very impressive. For the price the quality is there for sure. Got as part of a mic/headphone budget package after my beloved AT 3035 disappeared. The sound is good if a bit over-hyped in the upper mids and not a lot of bass. On my male baritone voice and guitar was under impressed. But recorded a woman singing with it and was blown away - it was like she was in the room when I listened to it every time after that. So, its now one of several mics I have - good for the collection, but more a special uses than general. If you're just getting into recording, not a bad first stop.